Birds of a feather flock together. We're all in the same boat. Great minds think alike. While just figures of speech to some, they reflect a simple truth--it's the company we keep that often determines the level of personal growth and professional success we achieve in life. Business leaders exchange information and ideas. They network to make deals and build partnerships. They work together to optimize best practices, and they reach out to leaders outside their companies to accelerate growth. Simply put, CEOs and business leaders provide value to one another that they can't find anywhere else. In The Power of Peers, authors Leon Shapiro and Leo Bottary introduce peer advantage, a concept that transcends peer influence. This is what CEOs and business leaders experience when they are more selective, strategic, and structured in the way they engage their peers. Peer advantage gives CEOs the insights to compete and the courage to act. 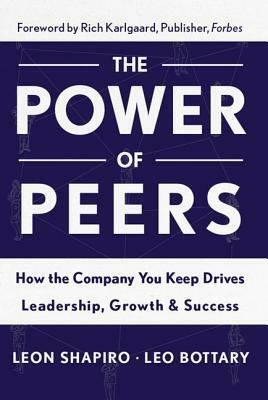 The Power of Peers features stories of business leaders from a range of industries to illustrate the five essential factors for peer advantage, how it impacts personal growth and why it has proven so effective in helping leaders identify future opportunities and challenges. It's what top, growth-oriented executives have relied upon for decades to be successful in business and in life. From 2013 to 2016, Leon Shapiro served as the CEO of Vistage International, the world s leading peer advisory membership organization for CEOs, business owners, and their key executives. He is a member of the Vistage Board of Directors and a director at The Advisory Board Company (NASDAQ: ABCO). Between 2007 and 2011, Leon served as Senior Vice President, Strategy and Operations, at Warner Music Group. From 2005 to 2006, he served as Group President of The NPD Group, Inc., a global provider of consumer and retail information, where he led all of their entertainment and technology related businesses. Leon earned his bachelor s degree in economics and political science from the Hebrew University of Jerusalem in Israel. Most recently, Leon has written for Fast Company and Vistage s Executive Street blog. Leo Bottary is Vice President, Peer Advantage for Vistage International, where he directs a thought leadership initiative on the power of peer influence for business leaders. Leo also serves as an adjunct professor for Seton Hall University s Master of Arts in Strategic Communication & Leadership program (MASCL), where he leads online learning teams. In April 2015, he was named adjunct teacher of the year for Seton Hall s College of Communication and the Arts. Prior to joining Vistage in 2010, Leo enjoyed a 25-year career counseling leaders in strategic communication. During that time, he served as a Senior Vice President (Corporate Practice) and Director of Client Service for the US at Hill & Knowlton. He also founded an award-winning public relations agency, which he sold in 2000. Leo earned a BA from Jacksonville University, an MA in Strategic Communication and Leadership from Seton Hall University and is expected to receive his EdD from Northeastern University with a concentration in Organizational Leadership in 2016. Leo s dissertation focuses on the power of peer influence for CEOs."